From models and fashion bloggers to fitness stars and pop singers, find out which Israelis are rising to fame through their Instagram feeds. Gal Gadot may be the most popular Israeli on Instagram (with more than 21 million followers), but there are many Israelis whose perfectly filtered and curated feeds are gaining fans in Israel and abroad. From fashion influencers and food bloggers, to models, singers and fitness stars, they all know how to snap a great photo and create quality content. Their feeds give followers a peek into their professional and everyday lives – whether that’s striking a yoga pose in the middle of the desert or getting recruited into the army. Below, get to know some of the Israeli Instagrammers who are rising to fame through their Insta-feeds. 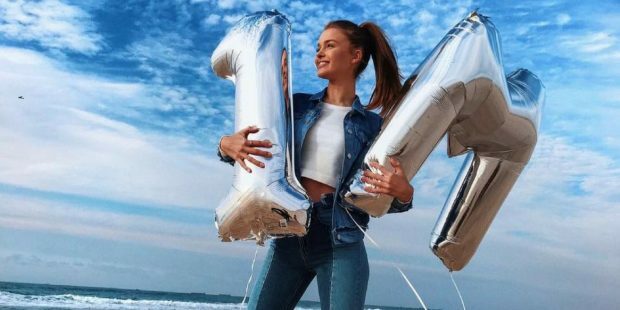 17-year-old Anna Kuzenkova, known as Anna Zak to her more than one million Instagram followers, is one of Israel’s biggest social-media stars. According to the Israeli Internet Association, Zak earned her status in 2017 as the number one most influential Israeli on Instagram, ahead of Israeli model Bar Refaeli. Her posts feature original music, lip-syncing videos and tons of selfies with captions in both English and Hebrew, though her native language is Russian. Zak began her career in 2014 on the Israeli kids’ reality show “The Boys and the Girls” and since then has landed major modeling gigs, launched a music career, and amassed millions of fans. Her first single, “Money Honey,” was released in August 2017 and currently has more than 3.8 million views on YouTube. An aggregation of impressive yoga poses, inspiring daily mantras and stunning views of Israeli landscapes, yoga instructor Talia Sutra’s Instagram is the page to peruse for yogis everywhere. She recently returned to Israel after living in New York for the past 17 years and traveling the world hosting yoga workshops and trainings. “Yoga selfies are a fun way to stay motivated and connected with other yogis. Also, they may (and do!) eventually trigger a deeper connection to the practice and its community,” the yoga star writes on her website. Now she shares her favorite fashion finds and vacation spots with her 292,000 Instagram followers. An impressive resume of brand collaborations includes Chanel, Chloe, Tresemme, Pandora, Samsung and Donna Karan, among others. Fitness model Avital Cohen’s strict gym regimen and perfectly toned features have become an international Instagram sensation. Some have called her the “Israeli Jen Selter,” referring to an American Internet celebrity and fitness model with more than 12 million Instagram followers. Cohen, who hit one million followers in March 2018, got her start posting workout routines and gym selfies and now runs her own athletic wear company, GymGirlGlam. Curly-haired model Eden Fines has been in the industry for several years, but she isn’t as well known as colleagues Bar Refaeli or Shlomit Malka just yet. She already has 113,000 followers, and with an Instagram feed full of funky fashion, style inspiration and travel photos, there’s no doubt Fines is on the rise. 19-year-old model Barak Shamir is not shy about sharing his life on Instagram. He often posts photos with girlfriend Noa Kirel, an Israeli singer and actress with nearly half a million followers of her own. Known for his mop of curly hair, Shamir has walked runways for international brands including Moschino, Missoni and Vivienne Westwood. When he’s not sharing photos from editorial shoots and ad campaigns, Shamir spotlights his life as a regular Israeli teen. In April, he shaved his famous ringlets and announced his recruitment to the IDF. Browsing through Romy Spector’s Instagram feed is like taking a virtual trip to the Mediterranean. The Tel Aviv-based fashion design student delights her followers with beautifully curated images of Israel’s pristine beaches, remote deserts and charming details from her journeys abroad. From Mitzpeh Ramon to the streets of Paris, you can count on Spector to inspire the perfect outfit for every setting. She often posts photos of outfits that followers can actually buy via her e-commerce fashion brand, De Rococo. Quirky food photos featuring fruits and vegetables with googly eyes, candy-piled slices of toast, and other creatively styled mouthwatering shots are what make Tel Aviv food artist and designer Lital Rozenshtein’s Instagram feed so popular. When Instagram turned to Rozenshtein in 2016 to design a celebratory post for Rosh Hashana, her googly-eye pomegranate shot got nearly one million likes on the company’s corporate account.